For over 32 years, Kidworks has been providing "hands-on" theater based experiences for children from poverty-stricken areas of Chicago, to children in rural areas who have limited access to the arts. 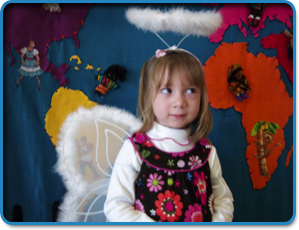 With your support we can provide educational materials to teachers, build costumes and visual aids for children, and create quality programs which reach out to 20,000 children a year. By placing instruments into the hands of a child who cannot see, building self-esteem in a child who is shy, and teaching children in wheelchairs to dance with their hearts ...your support does make a difference!!! ...the kids will be glad you did!!! Kidworks Touring Theatre Co is a 501 (c) (3) not-for-profit organization registered in the state of Illinois. Your gift is 100% tax deductible, and you will receive a tax deductible receipt. the Service Club of Chicago...and many generous individuals.